If you happen to find yourself in the heart of the city, strolling down one of the most lively streets of Zagreb, Tkalčićeva and you suddenly get hungry, I have a proposition for you. Just about 200 meters from the main square there is a great burger joint, ROCKET burger. Although from the outside it appears like an ordinary cafe, the moment you peek inside you will see otherwise. Everybody speaks English, easy surf or rockabilly music is playing and delightful tastes of grilled meat are spreading through the air. This atmosphere is completed by the offer of “American classics” – burgers, chicken wings, onion rings, fried potatoes, American pancakes and desserts. It does not have a big choice, but it is more than sufficient for a small size dinner, which the ROCKET burger is. It doesn’t matter which food I opt for, their homemade dips and side dishes make everything delicious. The spices they use in preparation are fresh, from the Harissa store. But the best here is a bacon hamburger. 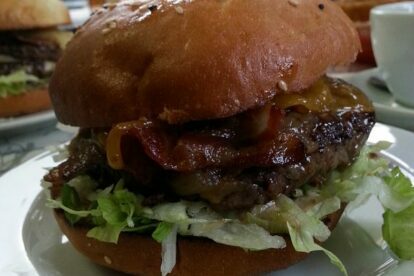 Prices vary from Kn 25 for a classic burger, Kn 32 with bacon and Kn 36 for a double burger. Finally there is a burger joint in the very center of the city where you can enjoy a proper burger.